"Ha, ha! The trick's on you!" Jake said proudly to his friend Michael, as Michael took a drink of his juice and immediately sputtered and spit it out. While he wasn't looking, Jake had put salt in his cup. "YUCK! That was AWFUL!" Michael loudly exclaimed. "I'm going to get you back. Just you wait and see!" The two boys were always playing tricks on one another. Most of the time the tricks were just for fun and were harmless, but sometimes the boys got carried away and forgot to think about the outcome and the tricks turned mean. Jake's father had a talk with him one day and told him a story out of the Bible about another person named Jacob, who played a bad trick on his father and brother, but not long after that, the tables turned and he was the victim of a cruel trick. After hearing this story, Jake tried to remember to always think about the outcome and not play tricks on other people that he wouldn't want them to play on him. Jacob had quite an eventful night sleeping on the ground, using a rock for a pillow, dreaming about angels, and having the Lord speak directly to him. He had a lot to think about as he went on his journey to Padan-aram to visit his Uncle Laban. 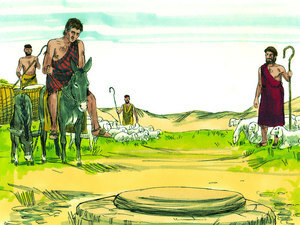 As he entered the land, he noticed a well. Gathered around the well were three flocks of sheep and their shepherds. There was a very large stone covering the well to protect it from debris. Jacob went to speak to the shepherds. "Hey! Where are you guys from?" he asked. "We are from Haran," they answered. "Well, what a coincidence!" Jacob said excitedly. "I'm on my way to Haran right now. Do any of you happen to know a man named Laban, the son of Nahor?" "We sure do," they answered. "Is he well?" Jacob asked. 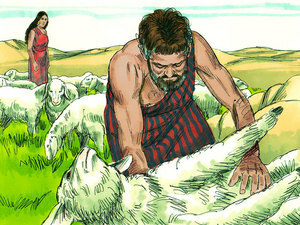 "Yes, he is fine, and there is his daughter Rachel coming with her sheep," they said as they pointed her out to Jacob. "Why are all of you just sitting here?" Jacob questioned. "We are waiting until all the sheep and cattle are here. Then we will water all of the herds and flocks at the same time," they explained. "That stone covering the well is so huge that it takes many men to move it. We have to wait until other men come to help." Jacob was barely listening to the men. He had his eyes on the beautiful woman walking toward the well with her sheep. With a sudden burst of energy, he walked over to the well, mustered up every bit of strength he had, and moved the stone off the well all by himself. 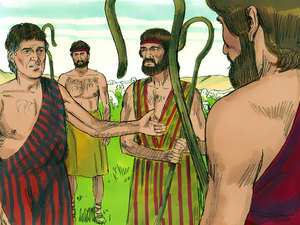 The other men watched in awe at Jacob's show of strength. They had never seen anyone else do what he had done. Rachel and her sheep moved closer to the well. Jacob approached her, gave her a big bear hug, and he kissed her. Rachel wasn't quite sure what to make of it. "Who are you?" she asked angrily. "And what makes you think you can just come up to me and kiss me? Of all the nerve!" Jacob explained that he was the son of Isaac who had married Rebekah, her father Laban's sister. He told her he had come on a long journey to visit with them. After Jacob's penitent explanation, Rachel's anger melted away, and she was thrilled to meet him. She quickly ran to tell her father with the sheep following behind, trying hard to keep up. "DAD!" Rachel yelled in excitement. "There is a man out here who moved the stone off the well all by himself! He says his name is Jacob, and he is the son of your sister, Rebekah!" 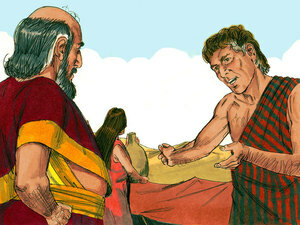 Without a moment's hesitation, Laban went to meet Jacob. "So good to meet you, my son!" Uncle Laban said jovially. "Of course, you will stay with us! Now tell me all about your family." Jacob stayed with Laban for a month, but he wasn't taking a relaxing vacation. 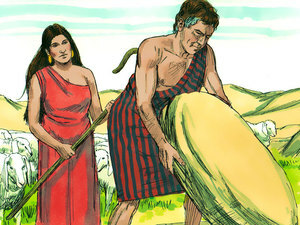 Jacob worked hard while he was with Laban, helping him in the fields and with the animals. Laban saw what a good worker Jacob was and appreciated his help. "You have been with us working hard for a month," Laban said to Jacob one day. "I am grateful for all you are doing, and if you are planning to stay here, I want to pay you for your work. Let's talk about wages." Jacob had no interest in money or material things. He knew that one day he would inherit his father's estate and he would be very wealthy. There was one thing Jacob did want though, and it wasn't a thing—it was a person. Jacob had fallen in love with Rachel almost from the moment he first laid his eyes on her at the well. "I will work seven years for you if you will let me marry Rachel," was Jacob's ready reply. "You have yourself a deal," Laban responded. "After all, it is better for me to have her marry you than some other man." 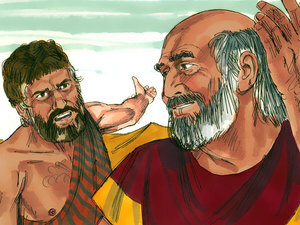 Jacob worked seven long, hard years for Laban, but it seemed like just a few days because of his great love for Rachel. Finally the big day that he had been waiting for came. At the end of the seven years, after his last hard day of work, Jacob cleaned himself up and went to have a talk with Laban. "I have completed my side of our bargain. I have worked for you for seven full years. Now it's time to marry Rachel. I want you to give me my wife," Jacob said emphatically. "Okay, Jacob. Settle down. You will get your wife," Laban said with a big mischievous grin. Laban sent out invitations to all his friends in the area. There was a buzz of excitement all around Laban's home as preparations were being made for the wedding. Laban spared no expense. The servants prepared a huge feast and people from all around came to celebrate the joyous occasion. Jacob was so excited he could barely sit still during the feast. He had waited for this day a very, very long time. Finally the party was over and all the guests had gone back home. It was very late, and Jacob took his bride to the home he had prepared for them. The next morning when it was daylight, Jacob got the surprise of his life, but it wasn't the good kind of surprise. Back in those days when a lady got married, she put a veil over her face that couldn't be seen through. Jacob had not seen the face of his bride. 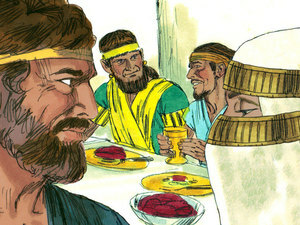 When Jacob saw his bride for the very first time that morning, he was shocked to see that Laban had played a trick on him. Instead of Rachel standing in the room with him, it was Rachel's sister Leah. Jacob was furious and stormed out of his home looking for Laban. "LABAN, WHAT HAVE YOU DONE TO ME? YOU'VE TRICKED ME!" Jacob shouted. "I WORKED ALL THESE YEARS FOR RACHEL, BUT YOU GAVE ME LEAH! THAT'S NOT THE DEAL WE MADE!" As you might imagine, Laban had expected this sort of reaction, and he was ready with an explanation, although it was a poor one. "In our country, it is the custom that the oldest daughter be married first. Leah is the oldest and she had to be married before Rachel could be married. Leah didn't have anyone that wanted to marry her. I had no choice. "I had to give you Leah but . . ." Laban continued, "I'll make it up to you. It will all work out in the end. Spend the first week with Leah, and then I will give you Rachel for a wife. But as you know, I'm a good businessman. I can't give you two for the price of one, so you will have to work for me another seven years." Whew! What a lousy deal that turned out to be! 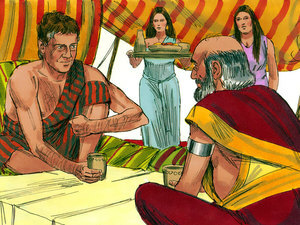 But Jacob loved Rachel so very much that he was willing to do whatever Laban required of him in order to marry Rachel. What was so special about Jacob removing the stone from the well? What did Jacob want in pay for all his hard work? How many years did Jacob work for Laban? How did Jacob feel about being tricked? Do you think Jacob remembered the trick he pulled on his brother? Do you think God approves of trickery? don't do it to someone else. do ye also to them likewise" (Luke 6:31).